Written by DAVE LAPHAM, PETER BAGGE, ADAM GLASS, HOWARD CHAYKIN, FRED VAN LENTE, ROB WILLIAMS & MORE! Penciled by JEROME OPENA, PACO MEDINA & PHILP BOND, DAVE LAPHAM, PETER BAGGE, HOWARD CHAYKIN & MORE! Has it really been 100 issues since Deadpool #900? Who cares! 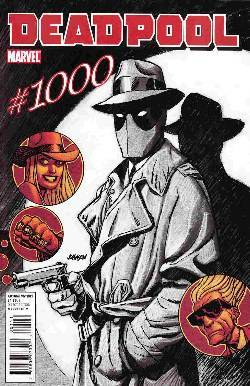 Some of comics' top creators take aim at the Merc with a Mouth in this massive 104-page special that pits the Deadpool against a cavalcade of baddies - including urban cannibals...underage hit men...mimes from outer space...and Lady Luck herself.